Centennial Village, a 52-unit mixed-use development at 52nd Street & Parkside Avenue is now accepting applications for tenants. The mixed-use development includes 9 accessible one-bedroom units, 2 accessible three-bedroom units, and 3 one-bedroom units with sensory features in the vicinity of N 52nd Street and Parkside Avenue in the West Parkside neighborhood of Philadelphia. LOCATION – Centennial Village is located across from Fairmount Park and in close proximity to the ParkWest Town Center, which includes a ShopRite, Lowes and other retailers and services. SEPTA buses 52 and 40 stop within one block of the site and the 10 Trolley stop is 0.3 miles away. UNIT MIX – 9 one-bedroom and 2 three-bedroom accessible units designed for mobility impairments and 3 one-bedroom units designed for sensory impairments are located in a 4-story apartment building designed to accommodate seniors and individuals with mobility/sensory impairments. Additional one, two, three and four bedrooms units are available in the vicinity. AMENITIES – Amenities will include individually controlled heat and air conditioning, Energy Star appliances, and in-unit laundry. There will also be two community parks and a community garden area, where residents will be able to grow their own vegetables. AFFORDABLE – Income limits apply to all units and income guidelines are included on the application. All accessible units include Project Based Voucher subsidies through the Philadelphia Housing Authority. Therefore, tenants will pay a percentage of their income. APPLICATION PROCESS – Applications for these units in the 4-story apartment building are being accepted now. Move-in anticipated in April to June 2018. Print and complete the Centennial Village Rental Application here. 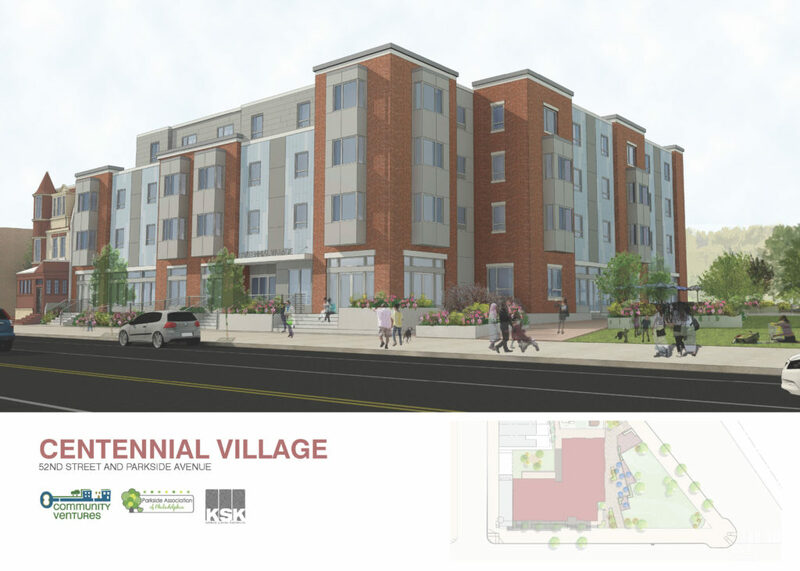 Mail your application to Centennial Village, c/o Octavia Hill Association, Public Ledger Building, 620 Chestnut St, Suite 1025, Philadelphia, PA 19106. To be considered, all applications must be mailed. Community Ventures will not accept applications dropped off at its offices or at Parkside Association’s office.